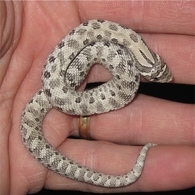 Axanthic ( Means lacking yellow ) is probably the rarest of the recessive traits to pop up in the <?xml:namespace prefix = st1 ns = "urn:schemas-microsoft-com:office:smarttags" />Western Hognose snakes. 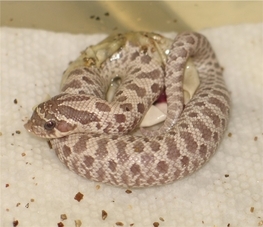 This trait is a magnificent ingredient to create new & exciting hognose morphs. 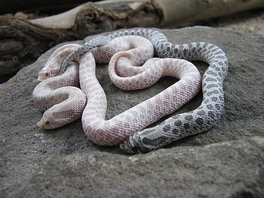 With the popularity of Albino - this new gene will be the key to creating the "Snow". 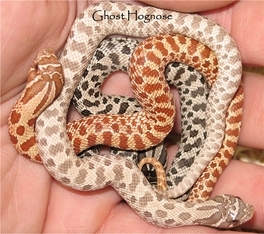 It also can be combined with the Hypo gene to create a "Ghost" Hognose ( which was done here first in 2010 ). The line of Axanthic we have here is our own line of Axanthic. 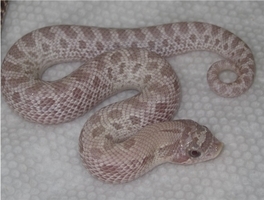 This trait popped up serendipitously in a clutch from a normal pairing we did back in 2000. The Axanthics from this line are strong rodent feeders & prolific breeders. Our line ( now coined the "New York " line ) has also been proven to be compatible with the BHB line of Axanthics. 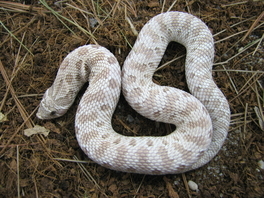 A Snow Hognose is in reality a Albino that is also Axanthic. Therefore it is white with Red eyes. We have been working on this project since we first made an Axanthic back in 2000. 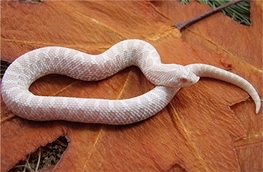 We simply bred an Axanthic male to an Albino female. The resulting offspring were completely normal looking double hets ( heterozygous or gene carriers ) for both traits. 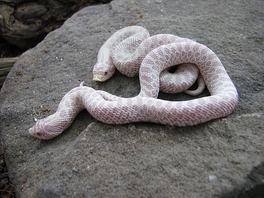 We then raised them to breeding size & they in turn produced our first Snow Hognoses back in 2003. 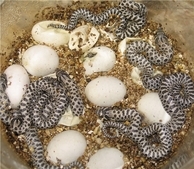 We were lucky to produce them that year considering our chances were 1 in 16 and we only had about 12 eggs. 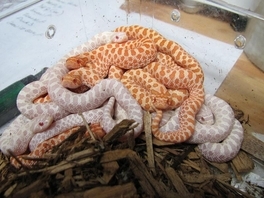 This year we bred our snow male to a Albino female that proved to be het Axanthic giving us 50% Albino het Axanthic & 50 % Snows.